DEVIL YOU KNOW — the new band featuring former KILLSWITCH ENGAGE singer Howard Jones, Francesco Artusato, celebrated solo artist and guitarist with ALL SHALL PERISH and THE FRANCESCO ARTUSATO PROJECT; and John Sankey, drummer for the Australian band DEVOLVED, who has also worked with FEAR FACTORY and DIVINE HERESY — has finished recording its self-titled debut album with producer Logan Mader (FIVE FINGER DEATH PUNCH, GOJIRA, DEVILDRIVER). 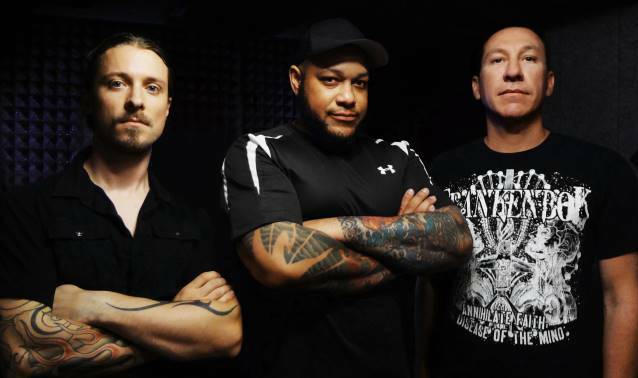 The CD is currently being mixed by Chris "Zeuss" Harris (HATEBREED, GOD FORBID, SOULFLY) for a spring release via Nuclear Blast Entertainment. "It's the record I've waited my entire life to make," states Artusato. "Logan really pushed us and brought the best out of us and now Zeuss is making it sound amazing!" Artwork for the album is currently being finished up by noted painter and illustrator Travis Smith (OPETH, KATATONIA, DEVIN TOWNSEND). DEVIL YOU KNOW's touring lineup is completed by guitarist Roy Lev-Ari and BLEEDING THROUGH bassist Ryan Wombacher. Said Jones said of the band's new additions: "After a period of being so intensely creative writing and recording the album, it's exciting to finally take it out on the road. "It's great to have the two new guys. "Roy is a great fit. "Ryan and I have played tons of shows together in BLEEDING THROUGH and KILLSWITCH and have known each other for years." DEVIL YOU KNOW will make its live debut on February 15 at Chain Reaction in Anaheim, California. The group is also confirmed for the 2014 edition of Australia's Soundwave Festival, set to take place in late February and early March. DEVIL YOU KNOW was born out of Artusato and Sankey's creative quest to stretch beyond their extreme metal backgrounds. The two had written over a dozen songs before even attempting to lock down a singer. "We were unsure if Howard would be interested," said Sankey." Yet, when KILLSWITCH ENGAGE's former frontman received the material, a creative ideal began to solidify. Finally connecting in Los Angeles during the last months of 2012, a highly distinctive sound began to become apparent. "It turned from bare-bones musical ideas into something that surpassed any of our expectations," said Jones. "It went from something we thought was going to be a fun, heavy project into something very real." It was during a recording session at the start of 2013 with producer and former MACHINE HEAD and SOULFLY guitarist Logan Mader that DEVIL YOU KNOW's ideas began to alchemize into something none of the bands members would ever expect. "It became a departure from what I'm known for," said Artusato. "I wasn't focusing on technical guitar parts (even though I still love that aspect of writing) but simply on writing what felt best for each individual song." The writing and recording process for DEVIL YOU KNOW's debut album "was surprisingly easy," stated Artusato. "When we get together it just works." The band is also quick to sum up the studio vibe with producer Mader as "intensely creative," said Sankey. "Logan definitely helped us realize and define the DEVIL YOU KNOW sound." Jones agreed: "He went from producer, to unsung member, to friend." "It's a different style of music for me," said Jones of DEVIL YOU KNOW's unique sound. "It's heavy as anything any of us are known for but I get to do some different things people won't expect. I've been singing almost all my life. Being around good songwriters and musicians in my former bands really helped mold me into who I am now."